Located in a tropical island with everyday modern facilities, only a short distance from both Male International Airport and the capital city , the hotel is the ideal spot from which to discover Male City and as well as the natural beauty of Maldivian Islands. 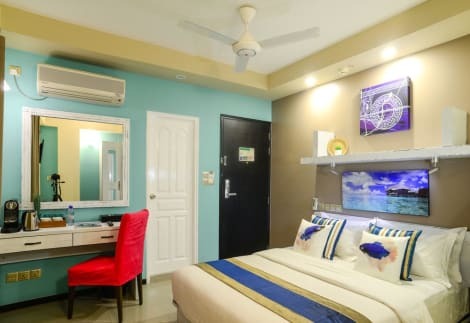 The hotel has been in operation since January 2013, and has since then become one of the most well known and well established Guest House in Hulhumale. The short yet highly successful experience in the business ensures that hotel well equipped to ensure that the dream holiday in the Maldives is an affordable, pleasant and enjoyable Holiday.Guests are always welcome here and hotel will take care of Holiday for the guests. Make yourself at home in one of the 32 air-conditioned rooms featuring espresso makers and LED televisions. Complimentary wireless Internet access keeps you connected, and cable programming is available for your entertainment. Private bathrooms with showers feature complimentary toiletries and hair dryers. Conveniences include laptop-compatible safes and desks, and housekeeping is provided daily.